L’ENISA lance un outil en ligne interactif présentant la législation et la réglementation nationales applicables et par secteur et sous-secteur, les autorités nationales chargées de la mise en oeuvre de la directive NIS relative à la sécurité des réseaux et des systèmes d’information. The NIS Directive is EU-wide cybersecurity legislation harmonizing national cybersecurity capabilities, cross-border collaboration and the supervision of critical sectors across the EU. Click on a sector to find out the national authority responsible in each EU country. Clicking the shield displays the national laws under this directive. Scroll down for more information. 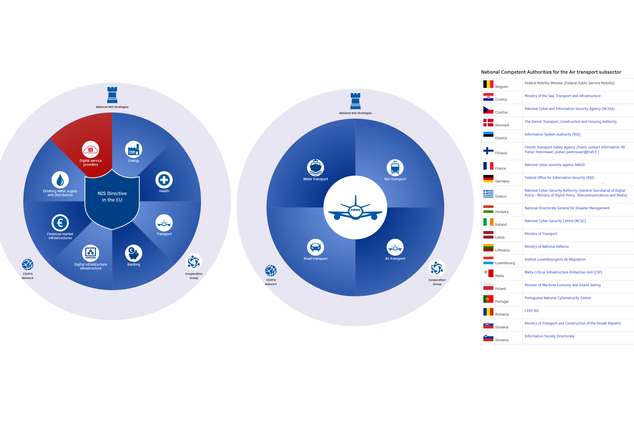 News Item Today ENISA releases an interactive tool showing the relevant national laws and regulations, and per sector and subsector the national authorities supervising the NIS Directive. Published on November 29, 2018 The NIS Directive tool is intended as a one-stop shop for experts from the industry linking to relevant ENISA work, national cybersecurity strategies, the CSIRT network, and the NIS Cooperation group website.